The Rufous-bellied Kookaburra (Dacelo gaudichau) is a member of the bird in genus Dacelo and in the Kingfisher family. The Rufous-bellied Kookaburra (Dacelo gaudichau) is found in the forests of lowland New Guinea, Saibai Island, Indonesia, Biak, Maluku / Moluccas Islands, Papua New Guinea, Melanesia and Queensland, Australia. 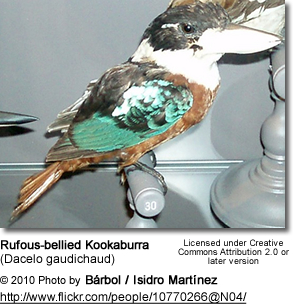 The Rufous-bellied Kookaburra has a white bill, and black cap. 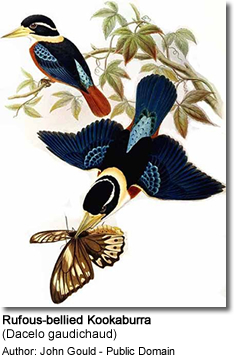 Its wings are multi-colored and tinged with blue, and its belly and tail feathers are a pale rufous. Its large, square head holds a long beak. The body is stout, and there is a white band around the neck. They are sexually dimorphic, with the males exhibiting a mix of blue shades on the tail feathers, while the females display a pale rufous color on the belly and tail feathers. The Rufous-bellied Kookaburra lives in pairs, not in family groups as is typical of other Kookaburras. Both parents incubate and feed the chicks. It feeds on small mammals, birds, reptiles, amphibians and insects. It kills and eats its prey in the same way other Kookaburras do, by pouncing on them and then preparing them by beating them against a tree or rock. They then swallow the prey whole, headfirst.